Picture this: It’s the first day of school. You are up making pancakes, excited to get everyone off to a new grade. But where are the smartly dressed students, excited to eat those flapjacks and be off to learn more mathematics? 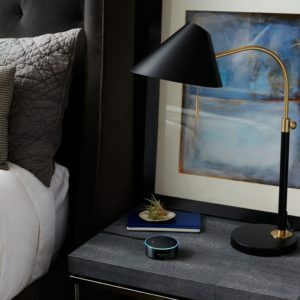 Instead of running around the house rousting them — while your pancakes burn, say, “Alexa, drop in on Jack’s room.” Your Amazon Echo or Echo Dot will ring in the bedroom, where Jack (no doubt spit-polishing his shoes) can say, “Alexa, answer.” And now you can talk to each other through the Echo so you can inform Jack the pancakes are ready. In order to use Alexa as an in-house intercom, in addition to all the other voice assisted tasks she can do, you need to have — for this case — one in the kitchen and one in Jack’s bedroom. Fortunately, the Echo Dot is on sale for $45, just in time for back-to-school. Get yours here.